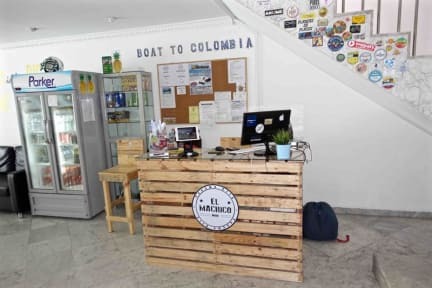 El Machico Hostel is a young and dynamic Hostel, situated in a big house in Marbella zone, among the more exclusive zones of Panama City. All facilities included : TV LCD, free WiFi in all the zones of the Villa, share computer, air conditioning and so much more. El Machico Hostel boasts an ample swimming pool and a terrace where you can relax sipping a drink. Besides the dormitory, we also have available a marvelous private room with a private bathroom, with direct exit to the terrace and access to the swimming pool. El Machico Hostel offers free breakfast to all customers. We can also book tours to Islands of St. Blas, Bocas del Toro and much more. Great Hostel, great staff, great stay ! Thanks for the nice welcome and all good advices. Très bel hostel près de tous les services. Je recommande pour tous ceux et celles qui veulent vivre Panamá City au cœur des grattes ciels. Piscine indispensable en raison de la chaleur et personnel accueillant! Location perfect, in city center, you can walk almost everywhere. The staff is very helpfull. Good prices for tours too. Very clean in general. The beds are confortable, double plug, matress firm. Not noise. Breakfast Included. With Pancake and syrup, coffe, milk, ice tea and fruit. Common area very nice, sofás, pool And music. Even a bar with drinks very Cheap. Great place and staff very helpful !!! Thank you guys! Very nice and clean hostel, the staff is very nice and friendly, the rooms are spacious! The pool area is very nice for relaxing and the kitchen is well equiped if you want to cook yourself. Only thing to say is that we had bedbugs in our room and nobody told us until we found out ourselves. Would highly recommend anyways, as the hostel was one of the cleanest we have stayed so far. Good place to stay in panama city, close to everything. Only 10$ usd with uber from the airport. Très sécuritaire pour y laisser ses bagages, le personnel est parfois un peu bête mais disponible, et l’endroit est propre. L’endroit est bien somme toute. Le personnel bête, mais ça n’a pas affecté notre séjour. La piscine est définitement un plus! Nous avons opter pour les dortoirs à 6 lits et c’était très bien. Vous pouvez vous faire de la nourriture facilement dans la cuisine partagée. Les douches de notre dortoir étaient très propres! Hostel sympa. Mais loin de tout. Merci !